Home Blood, Heart & Circulation What's My Blood Type? Many people are not aware of their blood type. You might not know what your blood type is until you get a blood test for some reason, or you are asked to donate some blood for a loved one. Your blood type depends on the genes you inherit from your parents. 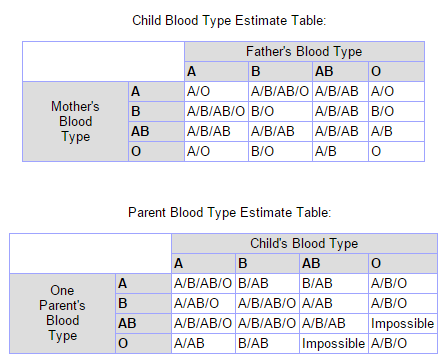 Blood types are grouped according to the ABO system and the Rhesus type. For example, you may have an O+ blood type (the most common) or an AB- type (the least common). Your parent each contributes an allele (a half gene) to give you a full gene (which is composed of two alleles). So your gene that determines your blood type is composed of two alleles, one from each parent. An allele may be an A, B or O genotype. The A and B alleles are dominant (stronger), while O is recessive (weaker). During your conception, if you mother gives you her A allele and your father gives you his O allele, your blood type gene will be AO, and your blood type will be A (because A is the dominant gene). If both your parents each give you an A allele, your blood type gene will be AA, and your blood type will still be A. This is also true for the B and the O alleles. But if one parent gives you an A allele and the other parent gives you a B allele, your blood type gene will be AB (they are co-dominant), and your final blood type will be AB. If both parents each give you an O allele, our blood type gene will be OO, and you blood type will be O. Now you ask:What's my blood type? In genetics, the chance that you will get a certain blood type depends on the type of genes each of your parents carry and how they will contribute to your genes. The other system of blood typing is determined by the Rhesus (Rh) factor. You can either be Rh positive (dominant) or Rh negative (recessive). If both your parents are Rh+, then you will have an Rh+ type of blood. If both are Rh-, then you will have Rh- blood type. But if your parents have differing blood types, then you will have Rh+ blood, since Rh+ is dominant. Here’s an illustration that can help answer what your blood type is. Want to know "What's my blood type"? You can try a blood typing test at home. You can buy a blood typing test kit online or ask a lab technician to help you get the test for free. Using a kit, you need to get a finger pricked to obtain a small blood sample (a drop) on a test card. You can use a sterile lancet or needle to make a small finger prick. A test card contains antibodies or proteins that react with the antigens in your blood. You need to place a drop of blood on each of four test fields and mix it with the antibodies using a clean toothpick for each field. Make a smear, about the size of a dime on each test field. If you are type O, no clumps will appear. Watch this video to learn how to test your blood type at home with a testing lit. Considering the ABO and Rh groups, your blood type belongs to one of these eight types: A+/A-, B+/B-, AB+/AB-, O+/O-. Blood type O+ is the most common type, while AB- is the rarest. Blood types also vary among different ethnic groups. For example, blood type O is more common among Hispanic people, while blood type B is common among Asian people. Blood matching for blood donations may also be affected by ethnicity. For example, many patients who havesickle cell disease areof African-American background, so blood donations for these patients often require that donors be of African-American blood to have a closer match. Type O: People with type O blood need a high-protein diet consisting of lean meat, fish, poultry, and vegetables. They need less grains, beans, or dairy. If you have type O blood, you may also need supplements to help ease tummy problems and other medical issues which type O people tend to experience. Type A: TypeA people need a meat-free diet and more fruits, vegetables, legumes, beans, and whole grains, which should be eaten fresh and organic, because people with type A blood tend to have sensitive immune systems. Type B: If you are a type B, avoid chicken, wheat, buckwheat, corn, lentils, peanuts, tomatoes, and sesame seeds. You need to eat green vegetables, certain meats, eggs, and low-fat dairy. Type AB: People who have type AB blood have low levels of stomach acid.They need to eat seafood, dairy, green vegetables, and tofu. If you are type AB, avoid alcohol, caffeine, and smoked/cured meats. Watch this video to learn more about blood type and your health issues.